It has rightly been called “The road to nowhere.” Situated on Norway’s West Coast, it is the longest of eight bridges that make up the Atlantic Highway. It’s uniquely complex architecture facilitates an optical illusion; so that seen from the angle of approach, the driver would think he’s taking a flying leap into the sea. And if that’s not scary enough, the bridge is often hit by European storms, and the mile high waves crashing over the bridge are sure to make the most daredevil of drivers turn away. Skywalks are built to be scary, and this one is sure to make your head spin with vertigo. The Glass Walkway, termed “The Walk of Faith” hangs off the edge of a cliff in the Tianmen Mountains; it is 60 meters long, 1.6 meters wide and is located 1430 meters above sea level. Despite being hair-raisingly frightening, the skywalk attracts thousands of tourists due to the breathtaking view it offers of the entire county. If this adrenalin-inducing bridge doesn’t get your heart racing, nothing else will. Unlike the two above, the Royal Gorge Bridge is a suspension bridge, not a cantilever one. It is the highest bridge of the United States, hanging 956 m above the Arkansas River. It is also one of the oldest bridges; built in just six months in 1929. This marvellous feat of engineering is a chief tourist attraction for people visiting the Colorado theme park. It was built with 1000 planks of Oregon fir, and is built to handle automobiles. The passing of vehicles makes the bridge shake and oscillate, giving an additional thrill to the experience. Malaysia is the country offering the most unusual & unique hotels of the world. And, as we can see from this post, the scariest bridges of the world. If you want to gain the illusion of hanging in the sky, then this bridge should be your destination. 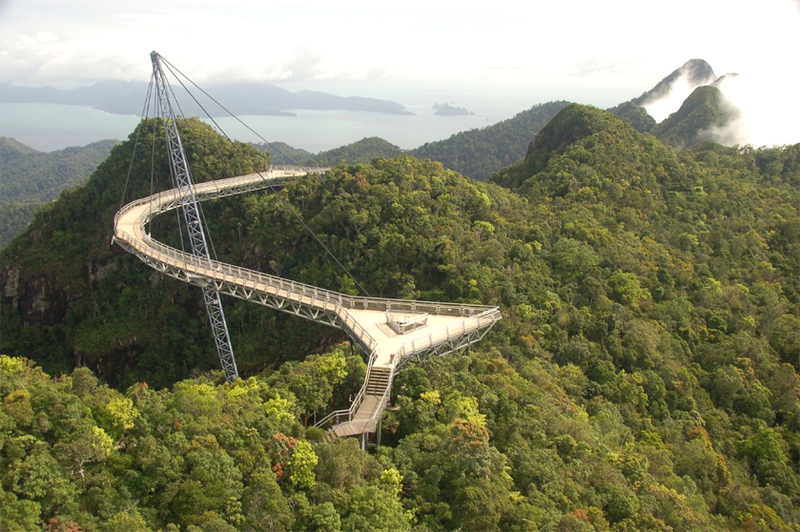 This astonishing bridge is 210 m long, and hangs a whooping 660 m above sea level. The cutting-edge architecture of the bridge consists of it being suspended by 8 cables, all hanging from a single pylon, which towers over the bridge. It also has three curves stretches extending 25 m each, at the end of each is a triangular viewing area for you to take in the scenery. This has to be the bridge that provides the most scenic view. Located above the Capilano River in Vancouver, Canada, the bridge is the centre of attraction in the Capilano Suspension Bridge Park. It is located 70 m above sea level and is 140 m long. The lush greenery of the West Coast rainforest and the calm stretch of the Capilano River can be enjoyed at its fullest while walking on the bridge. The bridge also ends in the Park’s latest attraction, a cliffwalk which clings to one of the gorges of the river, offering a splendid view of the surrounding countryside. It is the bridge that offers you the best view of the Swiss Alps. It is a lean pedestrian-only suspension bridge, hanging a 100 m above sea level and is 170 m long. The breathtaking view of Lake Triftsee and the Trift Glacier is what attracts thousands of tourists around the world to this serene place. Though the bridge itself is very stable, its minimal wiring and the wide-placed wooden planks make it look quite risky, leading to your adrenaline peaking while trekking through the unique construction. China is leading the race for the best constructed bridges, and the Sidu River Bridge testifies to the engineering calibre of Chinese builders. This jaw-dropping 1222 m structure passes through the valley of the Sidu River, and is located around 550 m above sea level. The deep gorges and the surrounding county-side make driving on the bridge a fascinating adventure. It is part of the G50 Huyu Expressway that connects Shanghai with the Chonquing province of China; a route that passes through a breathtaking expanse of mountains and natural scenery. The bridge is held up by H-shaped towers, and is currently the highest in the world. Switzerland is famous for the scenic beauty of the Swiss Alps; and there’s no better way to connect its natural beauty with the thrill of skywalking than by stepping on to the Titlis Cliffwalk. The bridge is a recent construction; it was opened to the public in 2009. It is located 500 m above the ground, stretches for 320 m and is only 3m wide. Prepare to have your senses befuddled by looking under your feet through the glass planks; at the dazzling whiteness of the Titlis glacier. Its reputation as the “scariest bridge in the world” has kept a lot of tourists from it, but if you’re the adventurous type, this should be the place to go. Everybody but really experienced drivers should avoid this route. If you’ve been on a roller-coaster track before, now you’ll know what it’s like to drive in one. This futuristically designed bridge connects the cities Matsue and Sakainimato, spanning over a mile of the Lake Nakaumi. It has a gradient of 6.1 on one side and 5.1 on the other, and is designed such that fishing fleets may pass underneath its peak. Though it’s designed to give the driver nightmares, navigation is easy once you’re actually on the bridge, which explains the traffic rush during peak hours. There is no better way to experience the beauty of the French Alps than by standing on the bridge in the midst of the mountain range, 3482 m above sea level. On the other hand, this short pedestrian only bridge can give you a serious bout of vertigo if you dare to look down. Connecting two cliffs of the Mont Blanc massif, it ends in a tunnel which leads to another glass encased skywalk. Reaching the place is a feat in itself, with the world’s longest vertical cable car taking you through an altitude difference of 2800 m.
Connecting two small and exhausted mining settlements of Mexico, the Puente de Ojuela stretches 300 m hangs around 318 m above sea level. It’s a pedestrian only suspension bridge that was originally commissioned in 1898 in order to haul gold and silver from the opposite mine to the town of Ojuela, from where it was sent to Mapimi for processing. Today, the mines are exhausted and Ojuela lies a ghost town, and the creepy silence of the deserted surroundings, as well as the savage beauty of the Chihuhua desert lying underneath, makes tourists flock to this out-of-the-way spot. The suspension bridge in the Otago Region of South Islands in New Zealand is additionally attractive as the world’s first site of bungy jumping. It was originally built in 1880 as a main route to the Central Otago goldfields. Today, the panoramic view of Kawarau River at a height of 141 m above sea level makes it a main attraction for tourists, both for bungee jumping and the scenic beauty. It is mostly used commercially as the dropping point for AJ Hackett Bungy, and taking a flying leap off the bridge into the blue-green river is one of the most exhilarating things you can do. The Hanging Bridge near the Ghasa Village of Nepal regularly tops the list of the scariest bridges of the world. It was mainly built as a convenience for the locals, in order for them to take their cattle across to the pasture on the other side. The rickety-looking bridge is actually extremely stable, but the gushing Buugdi Khola river underneath can frighten the most daunting of explorers. If you’re looking up the strangest bridges of the world, you must have come across this. Monkey bridges of Vietnam consist of nothing but a long bamboo pole with a single hand railing, leading to you take a stooping monkey-like position to cross the river underneath. These bridges have been used by local people over hundreds of year, but can raise serious spikes of fear in tourists. For the really adventurous sort, the gripping and crossing can afford a wonderful thrill of excitement. All that bridges are so so so beautiful. I would not use any of the bridges shown ?? Just can’t figure out how such scary bridges are suspended in the sky. Do they use helicopters to make them? May have to add the new highway bridge that spans the gorge of Hoover Dam. I loved the Royal Gorge Bridge of Colorado. Even Nepal is listed here. Monkey Bridge scared me. Does it resist the heavy rains and flood?? But thank you for posting. Been to the Royal Gorge more than once…it is very breath taking. However, it states above that the bridge is 965m above the river when in fact it is 956 FEET. Don’t get me wrong, 956 ft is a long way down, but only about a third of the distance mentioned above. WOW! the bridges are very scary, watching them from my laptop really got my head spinning. I may be wrong but I believe the Royal Gorge Bridge was originally a railroad bridge, not for automobiles as stated. Breathtaking structures but my favorite bridge is still Tower Bridge, London.